At least 26 people are reported dead, dozens injured after an express train traveling from Moscow to St. Petersburg derailed. The crash was caused by a homemade explosive equivalent to 7 kilograms of TNT, the FSB said. Russia’s Federal Security Service (FSB) head Aleksandr Bortnikov said that a special group of FSB, Investigation Committee, Interior Ministry and Prosecutor General’s Office officials has been formed. The fate of 18 people is still unknown. Sixty people have been taken to hospital. Around 1,000 people are working at train crash site. The rescue operation has intensified: seven helicopters have been sent to the scene some 250 miles north-west of Moscow. A criminal case on charges of terrorism and illegal storage of weapons or explosives has been opened regarding the train crash, the Prosecutor General’s Office informed. President Medvedev has held a videoconference with officials at the headquarters of the Emergencies Ministry, who have briefed him on the situation. The train left the Russian capital at 7 p.m. and went off the tracks in the Tver region, about halfway into the 4.5-hour journey. Overall 682 people were aboard the ill-fated Nevsky Express train. The express has 12 carriages, of which three derailed as a result of the crash. One of the three was severely damaged. Foreign citizens could also have been traveling by the Nevsky Express train: a person whose name is I. Sbalzarini is listed among the passengers in carriage eleven, and R. Rajesh was possibly in carriage ten, according to Interfax news agency. The Italian Foreign Ministry has confirmed that one of their citizens was traveling on the Nevsky Express. Italian citizen Armanda Noacco is currently being treated in the Valday Town Hospital. She is undergoing surgery suffering from several fractions. Her condition is considered “moderately grave”. The Finnish Foreign Ministry has denied earlier reports that the country’s citizens were possibly injured in the incident. They said they checked the information and confirmed that none of their citizens suffered in the crash. An Estonian official has made similar statements. 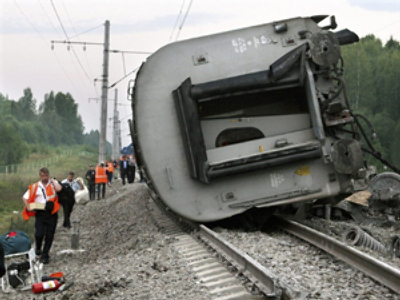 A terror attack could be the cause of the accident, said Russian Railways company chief. Also, according to him, the Friday explosion resembles a similar accident three years ago. As a result, police in the area are looking for suspects, and there is a search in progress at the moment. Another reason is that witnesses who got off the train say they saw a crater near the tracks, which could indicate that there had been some sort of blast. Law enforcement services are conducting an inquiry to establish who may have been involved in the Nevsky Express explosion. Specialists continue to examine the site, where a bomb crater was found. It confirms the theory that an explosive device went off by the train tracks, a source in the investigation group told Itar Tass news agency. Inhabitants of the nearby residential areas, taxi drivers and store owners are being questioned. Specialists are also checking all mobile telephone calls in the area. Law enforcement authorities believe the crime had been premeditated for more than one month. Survivors of the crash say that the last carriage of the train suffered the most. “It was around 21:00, I was reading a newspaper, then there was a loud crackle and the carriage started leaning,” one more survivor recalls. Two police officers happened to be on the train, and they led the evacuation process after the crash until help arrived. All those who were fortunate enough to escape injury and brave enough to board a train again proceeded to St. Petersburg on the modern high-speed Sapsan train, which arrived in St. Petersburg at approximately 4 a.m. Eight buses arrived at the scene to evacuate over 360 passengers from the Nevsky Express. Some people were evacuated by a Samara-St. Petersburg train. The evacuation of passengers from the derailed Nevsky Express train has been completed, a source from the Emergency Ministry told RIA Novosty news agency. Most of the injured have been taken to the hospitals of Moscow and St. Petersburg for medical assistance. Emergency Minister Sergey Shoigu has ordered that the relatives of those killed be provided with the opportunity to get to the scene of the accident to help officially identify the casualties. The minister also said that verified lists of those hospitalized and the missing people will be drawn up and made public. The Emergency Ministry has sent a special transport to the scene to clear out the debris of the train. Moscow authorities are to consider the issue of monetary compensations to those who were injured in the crash and to the families of those who were killed in the incident. St. Petersburg Governor Valentina Matvienko has also promised help to the victims of the tragedy. RZD will pay 500,000 roubles (around $17,000) to each family that lost their loved one in the crash and 100,000 (almost $3,500) to those who were injured. The incident has delayed approximately 60 trains on the Moscow-St. Petersburg line from Moscow to St. Petersburg, as well as from a number of other major cities travelling there, such as Tallinn, Petrozavodsk, Pskov, Murmansk, Veliky Novgorod and Helsinki, according to the Russian railways company RZD. The trains delayed in the opposite direction are bound for Moscow, Adler, Rzhev, Volgograd and Sevastopol. The average delay is about eight hours. RZD promises that all passengers of the delayed trains will be getting meals and water. All those concerned about the time of arrivals and departures are advised to use the hot line 8-800-200-67-67. Rail traffic has partially resumed in the area of the incident. And the first train from St. Petersburg to Moscow after the crash has arrived at the station. Meanwhile, the Russian airline company Aeroflot has said it will organize additional flights from Moscow to St. Petersburg starting from Saturday, a company representative told Ria Novosti news agency. Planes with larger holding capacity will be employed. Aeroflot will be making eight flights from Moscow to Russia’s “Northern Capital” daily. It is not the first time such an accident to have occurred on the Moscow-St. Petersburg route. On August 13, 2007 a Nevsky Express train derailed in Novgorod region, injuring 60 of 251 passengers. An explosive device loaded with the equivalent of 2 kilograms of TNT was placed under the rails on a bridge, in an attempt to crash the train into a river below. But the air pressure from the approaching train activated the self-made bomb earlier than planned, derailing 13 carriages after the express passed out of control over the bridge. Two men from Ingushetia were charged with transporting material for the bomb to Novgorod region; one of them is on the federal wanted list for assembling and placing the explosive device under the rail. In December 2003, an explosion tore through a morning commuter train in the southern Stavropol Region, killing nearly 50 people. Two years later, a passenger train heading from Chechnya to Moscow derailed about 150 km from the Russian capital. 42 people were injured. Another serious rail accident, though not connected to terrorism, happened in June 2007. 12 people were hurt when a passenger train collided with a freight train in southwest Russia. The Nevsky Express was first put into operation in 2001. It became the fastest form of land transport between Moscow and St Petersburg. The train is capable of speeds of up to 200 kilometers an hour and makes no stops along the way, meaning a journey time of four and a half hours. Usually there are 13 carriages for passengers, accommodating over 600 people. Russian Railways announced last year that the train will soon be taken out of service when a new, more modern replacement is unveiled.